Title: Dungarvan CBS Class In School Grounds During The New School Opening. Title: Dungarvan CBS Pupils In School Yard; Opening Of New Primary School. Title: Dungarvan CBS Class In Playground; Opening Of New Primary School. In front of Powe’rs Brewery, St Brigid’s Well, Shandon, Dungarvan. Pair of stereoscopic images of Clonmel Railway Station. 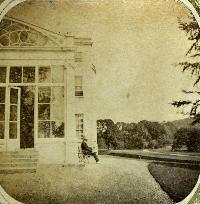 Man sitting on a bench beside conservatory doors at Marlfield House, near Clonmel. Pair of stereoscopic images of a view from the Dark Walk at Newtown Anner House. A woman sits, leaning against a large ornamental flower pot. The Temple summer house is visible at the end of a long walkway lined with large potted plants. A second woman stands in the walkway to provide scale. One of two stereoscopic views of a view from The Dark Walk, Newtown Anner. A woman sits, leaning against a large ornamental flower pot. The Temple summer house is visible at the end of a long walkway lined with large potted plants. A second woman stands in the walkway to provide scale. Man sitting on a bench at Marlfield House, Clonmel. Dungarvan Christian Brothers School. Students in the school yard during the opening of the new primary school, with Rice’s Street in the background. Mr Phil Duggan (teacher), with his class in the playground of the Christian Brothers School, Dungarvan, with Rice’s Street in the background. This is the occasion of the opening of the new Primary School. Pair of stereoscopic images of the geometric garden at Newtown Anner House, Co Tipperary. 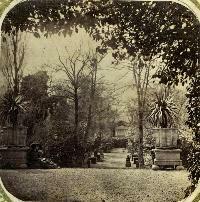 It is likely this garden was built by Lady Osborne who redesigned the gardens at Newtown Anner. 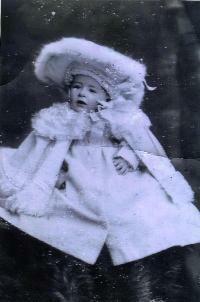 Aged 19 when she married her 58 year husband she led a fairly lonely life due to the husband’s anti social tendencies. Two men sitting on the bank of the River Suir with stone bridge in the background.Two men sitting on the river bank.View appears to be taken from upstream of the bridge, which is Sir Thomas’s Bridge downstream of Clonmel.